A birth defect is a structural or functional abnormality present at birth. A birth defect may be caused by factors such as obstetrical complications, genetics, toxins, birth injuries, or infections. Birth defects can be very serious, and they can cause physical or mental disability, death, or other lifelong disabilities or injuries. Some birth defects are detected before birth while others aren’t detected or diagnosed until the neonatal period. Every 4 ½ minutes, a baby is born in the U.S. with a birth defect. This amounts to 120,000 babies born every year with birth defects. Birth defects can affect any part of the body, including the heart and brain. These defects can affect how the body looks and/or functions, and they can impact the child’s well-being. A birth defect may affect a child’s lifespan depending on its type and severity. The structural problems that are the result of birth defects are termed “congenital malformations.” These malformations may be due to abnormal tissue development or a deformation arising from mechanical stress to normal tissue. For example, deformations can be caused by low amniotic fluid (oligohydramnios). In early pregnancy, amniotic adhesions can cause deformities or constriction of the umbilical cord. There is also concern about pressure deformities, such as clubfeet, from not having enough free space in the womb. Birth defects can occur during any stage of pregnancy. Most birth defects occur in the first 8-9 weeks of pregnancy when the baby’s organs are still forming. During the last 6 months of pregnancy the baby’s tissues and organs continue to grow and develop, and birth defects can occur during this period as well. Some defects, such as a cleft lip, are easy to see. Others, such as heart defects or hearing problems, are detected using tests, such as an echocardiogram, x-ray or hearing test. 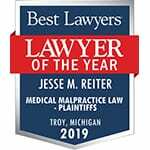 If you believe your loved one’s birth defect resulted from a preventable birth injury, misdiagnosis, or other instance of medical malpractice, please call Reiter & Walsh ABC Law Centers. Our team of birth injury attorneys will provide you with a free case review. Should we take your case, our payment policy ensures that you will not be charged until we win or settle in your favor. Contact our award-winning legal team today to begin your free legal consultation: You may call us toll-free at 888-419-2229, complete this quick online contact form, or press our Live Chat tab.